Police said the male spray painted a band's upcoming album release onto the sidewalk inside the Veterans Memorial then fled in an unknown direction. 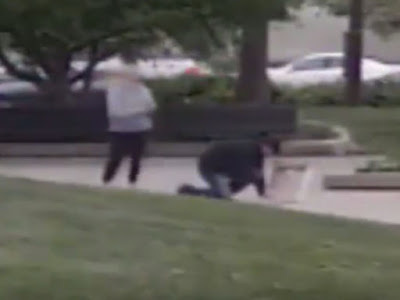 PHILADELPHIA – Philadelphia Police are seeking two people who were seen on camera allegedly vandalizing a veterans memorial in the city recently. Police said anyone who can identify the two should contact police immediately. According to police, the vandalism occurred on April 23 at the Vietnam Veterans Memorial at Front and Spruce streets. In the footage released by police, the two suspects walk up to the memorial, the male places a stencil on the ground, and spray paints the ground while the female watches.